* Black Wrinkle Coat Finish Fits 11-14 Mustang GT 5.0 and Boss 302. This BBK Performance Black Out Series Cold Air Intake System adds great looks under the hood as well as improved horsepower and throttle response in minutes with simple hand tools ! 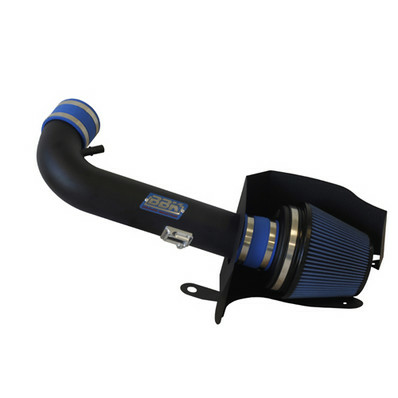 This Great Looking Mustang GT BBK Performance Black Out Cold Air Kit adds a stealthy, modern look under the hood of your favorite performance 11-14 Mustang GT or Boss 302. As always it is a direct fit replacement kit with no tune required - Simply installation with hand tools. Once Installed you will have increased throttle response and some great additional rear wheel horsepower. Click Here for Instructions No one else can Stack up to the bold clean styling of our aftermarket Billet / Stainless Steel Dress Ups, Street / Strip / Racing Suspension and Performance Parts for your American Muscle Car! Fits these Vehicles: 2011 2012 2013 2014 V8 GT 5.0L Coyote Boss 302 Mustang Roush & Saleen Vehicles.